Samsung and Apple hardware accounted for 68 out of every 100 smartphones that were sold in the U.S. during the last quarter of 2013. That figure is 11% higher than the fourth quarter of 2012, just over a year ago. 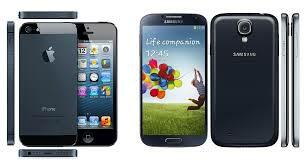 Apple was able to widen its gap with Samsung after brisk sales were experienced for its new line if iPhones. Industry research firm NPD Group released a report that showed Apple had increased its market share in the U.S. to 42% during the 2013 fourth quarter from 35% in the 2012 fourth quarter. Samsung also gained ground during the most recent quarter that ended December 30, 2013. The South Korea based company increased its market share in the U.S. to 26% from 22%. Two thirds of all smartphones sold in the U.S. during last year’s fourth quarter were either made by Samsung of Apple. In comparison, every other company with the exception of LG saw its market share in the U.S. fall. LG was able to improve its share slightly from the fourth quarter of 2012. However, companies such as Blackberry, HTC and Motorola all experienced steeps falls in sales. The dynamic taking place between Samsung and Apple is notable in that the Cupertino, California based Apple was able to increase its market share lead over its rival. The latest generation iPhone 5c and 5s have proven to be more popular with buyers in the U.S. than Samsung’s Note 3 and S4. This news was not good for Samsung, which just last month lost the top position in smartphone sales in China to Xioami, a local business. The electronics giant also had to cut its forecasts for profit, as its sales of the Galaxy S4 ended short of its goals by tens of millions of units across the globe. Nevertheless, Samsung is still the largest supplier of mobile handsets in the world and in China, the Android platform is sold in the vast majority of the handsets that are sold. Smartphones today account for nearly 60% of all the cell phones sold in the United States. That figure is 52% higher than the same period just one year ago.